In the fast paced action Fugitive Sparrow it isn't the sky that falls on the little birdy. Instead there are huge boxes falling down that could crush the poor little thing. The player controls the bird and tries to avoid the boxes and by moving the bird to save area once the icon on top of the screen indicates an incoming box. Sometimes there is candy falling from the sky and you should try to collect this candy. Don't get greedy because no candy is worth not only losing the game but also getting smashed to death by one of the boxes. 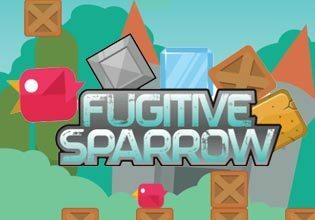 Play Fugitive Sparrow now for free and take good care of birdy!